PostgreSQL data masking tool by DataSunrise converts corporate sensitive data to unreadable characters. That hides information when you give an access to the database. Outside users do not see the real values (salary, for example). Dynamic data masking works at the moment of a query, immediately. No more need to copy DB first and change the data after. DataSunrise provides PostgreSQL data masking tools effectively protecting against sensitive data leaks. Sometimes an organization has to engage outsource developers and testers. PostgreSQL data masking tools can be used to avoid data breaches by replacing real data from selected columns. At the same time, DataSunrise retains the structure of the original data. Our product uses the same algorithms for dynamic and static data masking but features have some differences in the way they are used. To perform static data masking, DataSunrise makes a copy of the PostgreSQL database and masks selected columns according to pre-set rules. There is no way to retrieve the original data from statically-masked data, but it can provide a backdoor for a breach when the data is extracted from the database. Also, it lags behind the actual data, so there maybe need for updating the data on a daily basis. Dynamic data masking is performed at the time of request, so the data doesn’t leave the database. 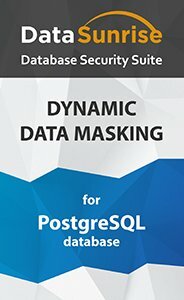 PostgreSQL data masking feature intercepts the query and changes it according to pre-set masking rules, thus the requester will receive masked data. We will demonstrate you the dynamic data masking functionality on the example of the following table. Create a new rule and select the target database. Select columns containing sensitive data. On the above you can see the response whet we try to access the table once again. PostgreSQL data masking solution by DataSunrise is scalable and highly helpful for database security and access management purposes.